Dunn Solutions is keeping up with master contractor Daniel Westbrook throughout 2017 as he renovates a historic Seattle residence. This video and post are a part of the ongoing series. For other related posts, click here. Now that you've successfully framed the pocket door, you're ready to hang and trim out the door. The Johnson Hardware instructions are helpful, and should be studied closely. However, there are some considerations that the directions leave out. First, check the edge of the door slab from top to bottom, looking for signs of warping. Face the least-warped side of the door towards the opening. When the door is open, the gap between the split jamb and the door should be even and consistent. Following the directions, install the roller brackets dead center at the top of the door. Make sure the bracket's locking tabs are installed on the side of the door selected for access. 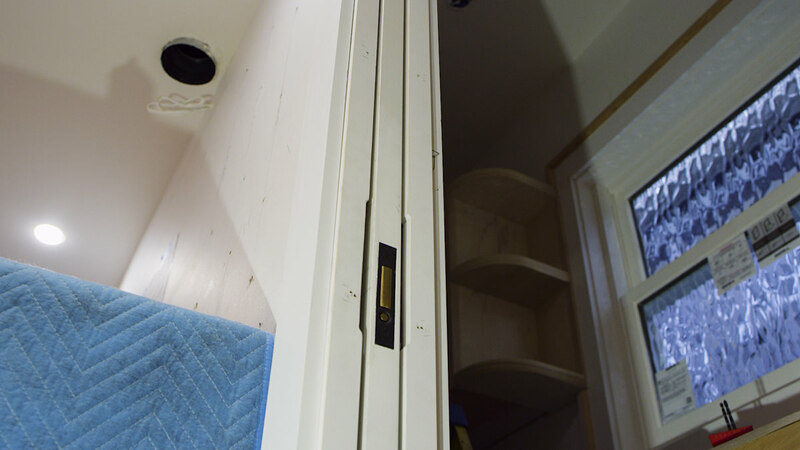 Before installing the rubber stop provided with the Johnson Hardware door kit, measure the depth of the pocket from the framing to the location where the finished jamb will be, typically adding ¾” off of the pocket door stud. Compare that measurement with the width of the door and the rubber stop. I like seeing the pocket door flush with the split jamb when it’s all the way open, as it offers a nice, tight look. For that reason, I find it preferable to have these two measurements the same. 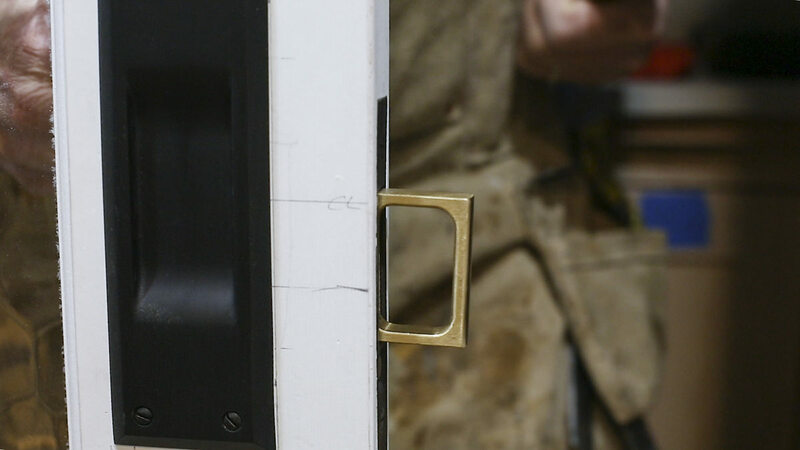 Once the rubber stop is installed, hang the door slab by securing the brackets to the rollers. Now slide the door back into the pocket. With a scrap of split jamb stock, check and adjust the door with the wrench so its sitting consistently plumb and parallel top to bottom, and flush with the outside edge of the split jamb trim. Now close the door, and check how the door is hanging at the full jamb. If everything looks close, install the split jamb side first, making sure it's flush with the door. Next, install the full jamb using the side of the door as a straight edge, and shim the jamb to match the door exactly. Once that is done, install the head split jambs. The split jambs should have a consistent and equal gap on either side to the door. While it is recommended that you install the split jambs with screws on one side for removal access, I don’t really see the point with painted surfaces. I always check the operation of the door at this point in the process, as well as how the door sits and looks with the jambs—just in case final adjustments are needed. If everything is dead on, then it’s time to install the casing. The manufacturer recommends that you avoid nailing the casing to the split jamb, as seen in their picture where the finish nails are angled away and into the stud behind. I recommend this as well, but have found that a couple of brads (nailed in the edge of the trim and the jamb) work wonders to make everything more solid. I figure these nails could be cut out with a multi-tool between the casing and the jamb if the jamb ever needed to be extracted. Use correctly sized nails, or else they will penetrate the door! At this point, you should have a working pocket door for the most part, but the hardware still needs to be installed. First, install the angled glides that come with the Johnson Hardware pocket door kit. Begin at the bottom of the split jambs to cradle the door in the middle of the opening—this helps the door run smoothly. These pieces are plastic and not the most attractive items in the kit, but they do work—and should be exposed so that adjustments can be made over time. Usually I'll install the handle hardware after the door is installed, and that’s okay except in situations where it’s a custom hardware door like this one. 1. Install the roller bracket dead center at the top of the door. 2. Check to see if the depth of the framing is flush with the finish trim, and install the rubber door stop. 3. Install the door slab and secure the rollers to the bracket at the top of the door. 4. Check to see how the slab is sitting with the split jamb flush and plumb. 5. Close the door and check the full length of the jamb. 6. Install the jambs to match where the door is hanging. 7. Install the casing. Make sure the nails don’t go into the split jambs. Note that the split jamb is recommended to be screwed to the side where the slab can be removed. 8. Pocket door latch hardware vary from simple to complex. Prior planning and morticing may be needed or beneficial before installation, while in other scenarios, pre-installation of the door hardware isn’t necessary. The advantages of a pocket door are pretty clear (they're great space savers), but if maintenance is needed, they are a little more difficult to remove than a standard hinged door. The reason for this is in the design: The split jamb abuts the door slab covering the door's edge. 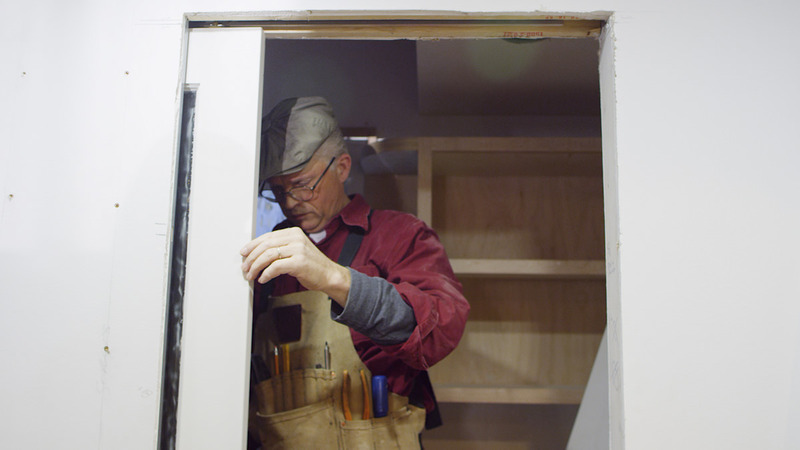 As a result, the only way to service the door is to remove the parts of the split jamb (and perhaps trim) from one side of the opening, in order to have enough room to then remove the door slab. When you're installing the door, jamb, hardware, and trim, take care to think through the process. Attentiveness will result in a final product that can be disassembled later—should the door require adjustment, removal, or repair. The manufacturer’s directions recommend using screws to install the split jamb, and aiming trim nails away at an angle so that they don't penetrate the jamb. (This way the split jamb can be removed without removing the trim.) However, I’ve found exposed screw heads to be a bit too bare for a fine, finished application, and frankly they usually get spackled and painted over anyway. The jambs usually get caulked to the trim during paint applications, so removing the door later will require that you knife the caulk and pry out the jambs. For that reason, understand that repainting will be necessary anyway. In stained or natural wood applications, there is no caulking or spackle to contend with, and the exposed screw heads can be the same color as the hardware (this makes removal a little easier). I suppose it is possible to remove the split jamb and then remove the door without removing the trim, but I’m not sure as I’ve never done it. Should the pocket door need adjustment, you'll need the Johnson Hardware door frame angled wrench and access to the top hardware. If the wrench can’t fit between the jamb and door slab at the top, then the top split jamb will need to be removed. No matter how the trim is fastened, the head split jamb is the most important piece to be removed. That’s why it should be cut to fit between the side jambs, and why it should be the first (and perhaps only) piece that would ever need to be removed. 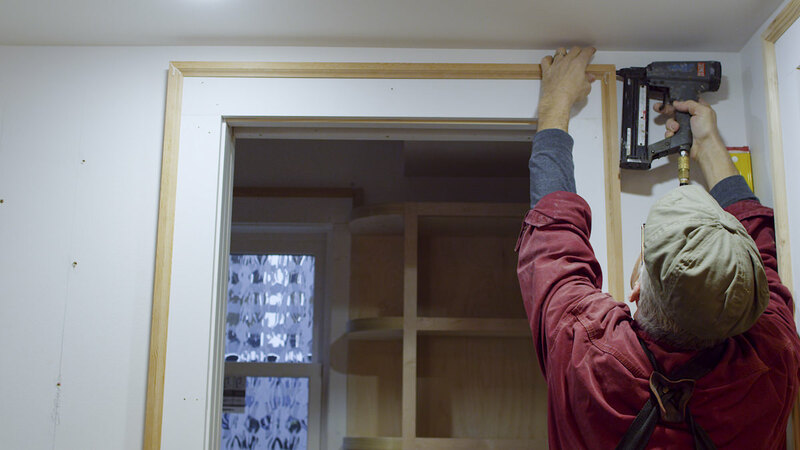 From framing to finish, pocket door installation can seem complicated. By taking the time to follow the process step-by-step, you'll find that it's actually a manageable project offering clean, polished results. Whether you are trying to maximize the return of your damage deposit at your first apartment or completing a punch list in an effort to sell a million-dollar project, the knowledge of how to properly repair a drywall screw pop could come in very handy. A panel of remodeling experts join the Dunn Lumber podcast to discuss how they got started, the current state of the industry, and what the future may hold.